Ensuring that your dependants are provided for in a financial sense after your death is one of the key tenets of estate planning. There are a number of methods by which this can be achieved. In many cases, individuals are primarily concerned with providing for their spouse and, as such, it is common for wills to be written that simply pass all of the testator's assets to their partner. However, this is often not the most efficient method; while this will ensure some degree of financial stability for your spouse, dependants further down the line (such as your children) are likely to find that they are faced with a large tax bill. Inheritance Tax (IHT) is currently levied at a flat rate of 40% on all assets above the threshold of £325,000. This threshold is known as the Nil-Rate Band. Assets passed from an individual to a surviving spouse upon the death of the former are exempt for IHT purposes, leading to the idea that a simple will such as the one outlined above is sufficient. However, this type of arrangement is ultimately ineffective from a tax point of view. While the first transfer of assets will not be taxed, if the estate still exceeds the Nil-Rate Band upon the death of the second spouse, the excess will be subject to IHT. This means that the next beneficiaries (generally children) will find that a significant portion of their inheritance is taken by the taxman. Thankfully, this is relatively easy to combat. The establishment of a Nil-Rate Band Discretionary Trust allows the first spouse to arrange for their assets to be placed into trust upon their death. The surviving spouse will be able to maintain an interest in those assets, but they would be legally separate from their estate. In this way, these assets will not fall under the auspices of IHT upon the death of the second spouse. Frequently individuals wish for some of their assets to pass not to their spouse but to other beneficiaries or dependants. 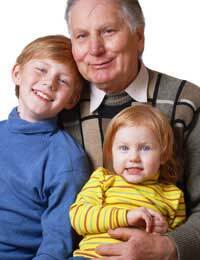 Many grandparents, for example, may wish to leave a sum for grandchildren who are still minors. This can again be achieved in a tax-efficient manner through the use of a trust. It is possible to establish trusts in which the legal title to the assets (most commonly cash or stocks and shares) passes to a trustee upon the death of the settlor (that is, the individual establishing the trust). When the intended beneficiary reaches a certain age, however, the assets will pass to them. In the meantime, it is also possible to arrange for any income generated by the assets to pass to the beneficiary; this is particularly useful in cases where grandparents are the primary carers of children. These types of trust are covered in more detail elsewhere on this site. There are a number of ways in which financial provision can be guaranteed for your dependants. As can be seen, however, tax concerns should be at the forefront of your mind when deciding on the best course of action. It is important to look into a variety of solutions, and to take independent advice before reaching a decision. While this may represent an initial financial outlay, it is likely to increase the effectiveness of your chosen solution.